The EHCI 2014 total ranking of healthcare systems shows The Netherlands again widening the gap to country #2 from 19 points in 2013 to 43 points in 2014, (in 2012, the margin was 50 points), scoring 898 points out of 1000, an EHCI all time high. Beginning from Switzerland (855 points) down, the EHCI 2014 shows competition at the top getting much harder with no less than 9 countries scoring above 800 points. The changes in rank should not at all be dismissed as an effect of changing indicators, of which there are 48 in the EHCI 2014, which is the same number as in the previous year. The Netherlands is the only country which has consistently been among the top three in the total ranking of any European Index the Health Consumer Powerhouse (HCP) has published since 2005. The Netherlands is sub-discipline winner, or joint winner, in four of the six subdisciplines of the EHCI 2014. The Dutch healthcare system does not seem to have any really weak spots, except possibly some scope for improvement regarding the waiting times situation, where some central European states excel. Normally, the HCP takes care to state that the EHCI is limited to measuring the “consumer friendliness” of healthcare systems, i.e. 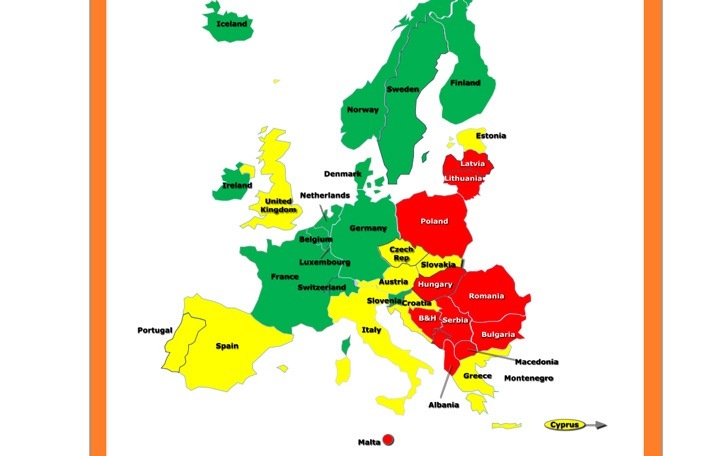 does not claim to measure which European state has the best healthcare system across the board. 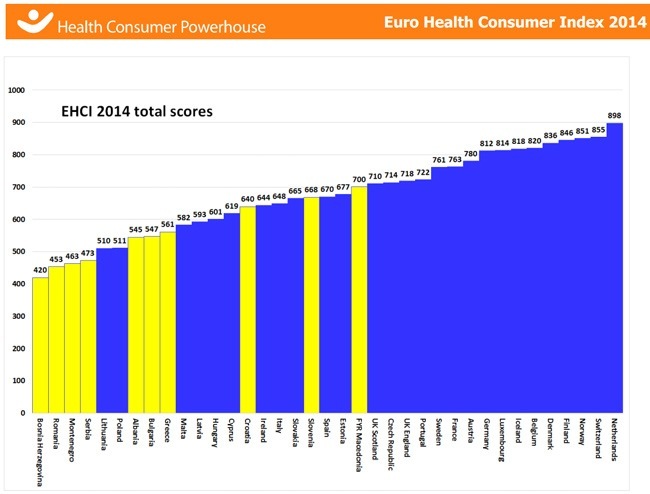 However, the fact that it seems very difficult to build an Index of the HCP type without ending up with The Netherlands on the medallists’ podium, creates a strong temptation to actually claim that the winner of the EHCI 2014 could indeed be said to have “the best healthcare system in Europe”. There should be a lot to learn from looking deeply into the Dutch progress! Switzerland has for a long time had a reputation for having an excellent healthcare system, and it therefore comes as no surprise that the more profound research which eliminated most n.a. scores results in a prominent position in the EHCI. Bronze medallists are Norway at 851 points; the very high per capita spend on healthcare services finally paying off! Ten years of open assessment have taught Health Consumer Powerhouse that there are surprisingly stable patterns of national healthcare systems of Europe. Some are quite positive: overall, the performance of almost every country improves year by year, offering more than 500 million people stronger patient influence, better access, reduced risk of medical failures, improved treatment outcomes and, even in times of significant funding pressure, extended range and reach of services in the public package. The negative impact from austerity policies were somewhat increased waiting in some countries (largely reversed in 2014) and slower inclusion of new pharmaceuticals in reimbursement systems. How come that national healthcare, contrary to large public systems such as education, and every successful private business, is reluctant to learn from the best performers among European health? “Not invented here” is still a strong, harmful culture. What are the lessons from some health systems (crisis-struck Baltic states the best example) doing the right things to recover while in other countries anarchy and deterioration is the pattern? How to implement the values, strategies and incentives that makes some countries radically repair “traditional” weaknesses such as waiting lists or weak patient positions, while other national systems never seem to gather enough focus and courage. This is about re-shaping and modernizing the biggest industry of Europe. It is absolutely necessary that this huge process of replacing poor, expensive performance with modern, value-for-money health delivery becomes a success.